Naples, Italy, last quarter of 14th century. Formerly in French, 19th-century green morocco by Marcelin Lortic; rebound in full blood red Nigerian goat by Deborah Evetts in 1970. Belonged early in the 15th century to the Olivetan monastery of San Girolamo at Quarto near Genoa (ex-libris inscriptions on fol. 301v and 414); Ambroise Firmin-Didot sale (catalogue, 1884, no. 131) to Labitte; purchased by J. Pierpont Morgan (1837-1913) from Olschki in 1912; J.P. Morgan (1867-1943). Ms. written and illuminated in Naples, Italy, in the last quarter of the 14th century. Texts: Master Matthew, Canon of Linköpins, Sweden, Stupor et mirabilia audita sunt (fol. 1-7v); Saint Bridget of Sweden, Revelationes (fol. 8-327); Alfonso Pecha, Epistola solitarii ad Reges (fol. 328-340); Saint Bridget of Sweden, Liber coelestis imperatoris ad reges (fol. 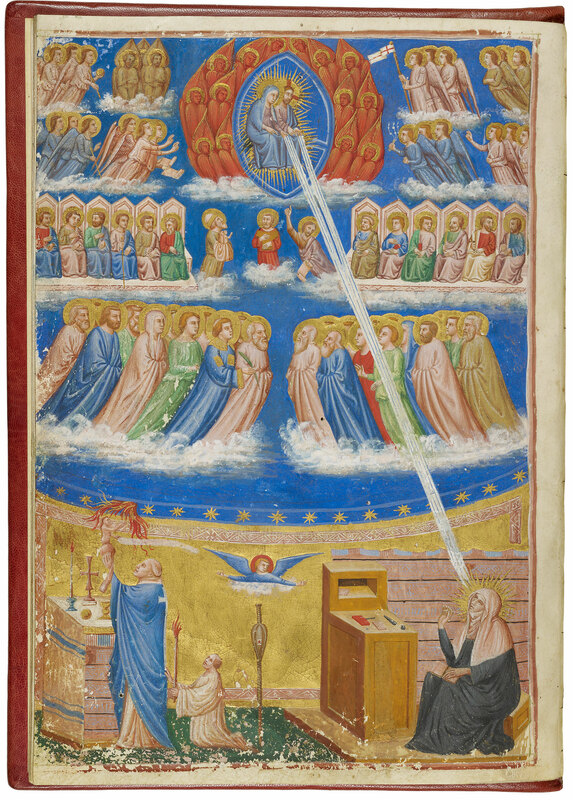 340v-390v); Sermone angelico de excellentia beatissime virginis (fol. 391-408v); Oratines divinitus revelatae (fol. 409-414). Pierpont Morgan Library. MS M.498 is manuscript "Y" in the Uppsala publications of the edited works of Saint Bridget of Sweden. Decoration: 2 full-page miniatures, 12 historiated initials.